My assigned blog this month was Adventures in All Things Food. I have to admit to a failing here as member of the Secret Recipe Club, I didn't go through the whole blog to find 'the recipe' for this month's reveal. I got stuck in one spot and could not move from there. It was Andrea's recipe for Gyoza Wrappers, home made Gyoza Wrappers that is. I did check out a few of Andrea's other posts though. Her Chicken Chasseur looked good, but it was an SRC recipe, sigh, so I couldn't make that, but I've got it bookmarked to make in the future. Nigella's Lazy Loaf is also on the list. Back to Andrea and her blog. Andrea lives on a working farm, and all that it entails. I feel a kinship with her. I grew up on a farm, which was my Dad's dream, and he worked so hard at it. He also wore many hats, although I don't think he was a mechanic, my brother did that part. We raised pigs, but also did market gardening. We had chickens, and a milk cow. We even raised our own beef. Looking back, I think we were as close to being organic as you could get back then. We used lots of 'natural' fertilizer on the fields thanks to the pigs efforts. Which brings me to this, my choice for SRC this month. I just never thought it was possible to make my own Gyoza wrappers. Why? I have no idea, but I'm so thrilled, I can make Potstickers any old time I want now. giggle. I actually have two recipes for Potstickers, and this is the second one. 1/2 cup Boiling Water (you can add a little teensy bit more, drop by drop, if it's too dry). then pour in the 1/2 cup Boiling water and stir with the chopsticks until the water is mostly incorporated. Form it into a ball, leave it in the bowl. Place a warm, damp tea towel over top and walk away for an hour. Make breakfast, do the dishes and then come back and roll out that dough. The longer the dough rests, the easier it is to roll out, BTW. I found it easier to cut it into equal pieces (32 in all, ) and roll out each little ball. Keeping them in the damp towel to keep the dough from drying out. You can see the layers from where I folded and refolded the dough. I gave it a real workout. I rolled out each ball, really thin. I then dusted them with some flour and stacked them up before cutting them into circles with the biggest round cookie cutter I had. And I left some 'free form' as well. Waiting for the rolling pin. OK, so it's a biscuit cutter, but don't tell the wrappers that, don't want them to get a complex. I then put them in neat little stacks inside a ziploc bag, well dusted with flour and put them in the fridge. I'll post about my next version of Potstickers soon. **You do need to separate them with some wax paper or plastic wrap if you're not using them right away. Even with the flour dusted in between the wrappers, they still stuck together. ***Update*** I made Potstickers using the wrappers and they were good. Really, really good. I can't wait to see what everyone else made this month. I just know there's going to be lots and lots of great looking food. oh wow...what an achievement! Looking forward to the potstickers when you make them. I'm thinking they may make an appearance tonight. I love Potstickers... And the wrappers, well, they were dead easy to make. I shouldn't let anyone know how easy they were to make. But they were, and just knowing how to make them, well, gee, I'm in trouble now. I'm thinking Potstickers for dinner tonight. giggle. I'm having a real Monday, sigh. Forgot to say, I can't wait to see what you found to make of mine. Heading over to look now. Ah, yes! You now have the power. Pot stickers anytime! Glad you enjoyed the recipe. 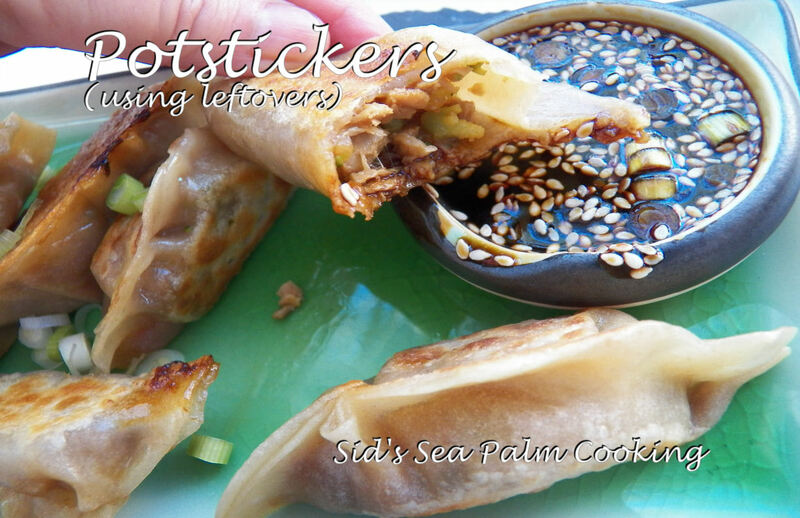 I love seeing what you create here, so can't wait to find out what you like to put into your pot stickers. :) Thanks for the kind words and cooking from my recipe list this month. I'm so excited. silly maybe, but still... Thanks for the nice words, I appreciate them. I've got ideas for the filling for these, using some leftover Pork Carnitas from dinner out last night. I'm making that Nigella's Loaf this week, it looks amazing. ok, YOU MADE POTSTICKERS FROM SCRATCH! Pause for Sally to collect her chin from the floor... my gosh! Color me impressed! HAPPY REVEAL DAY! You hit this one out of the park! I could eat them every day too... I just don't want my hips to get any bigger,sigh. Thanks for the kind comments. Happy Reveal Day to you as well. Is it bad that I've never had Potstickers? I will definitely be checking out your recipes. And now that I know I won't have to buy any special wrappers, I am more likely to make some. Do the chop sticks do something special for the dough, or would a wooden spoon work just as well? I think I have some chop sticks around here, but I'd have to look. Not bad at all. You've got a whole new world to explore now. I think the chopsticks will actually be better than a wooden spoon, because the dough won't stick as much. But then again, you use what you have and work with that. I keep a package of chopsticks around because I use them a lot. I even eat with them. I didn't realize how simple gyoza wrappers were to make. We love gyoza!!! I just used some to make some potstickers for dinner and they were AWESOME!!!!! Well, you made that look super easy. I need to try it! Great SRC pick! Thanks, but they were a little too easy, sigh. I've now made potstickers from them twice, but the rest are in the freezer, waiting. This recipe is going to be one I make, a lot. I love that you made wonton wrappers from scratch!!!! How totally fun. 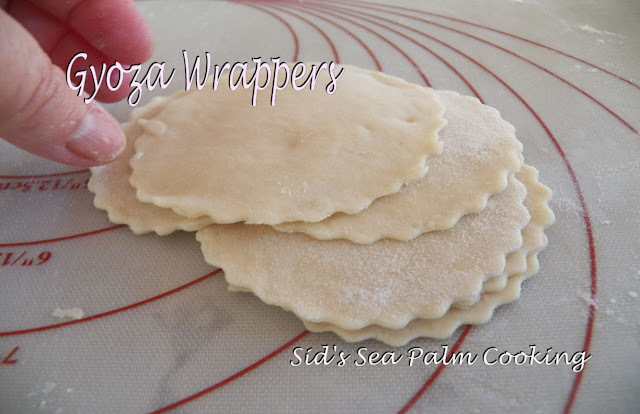 They can be used for so many great appetizer fillings. I've got to make these now! I really enjoyed reading your post too, Sid. I always wanted to live on a farm, and am so envious of people who do. Great pick this month!! I agree with you, they are so versatile. And I can't wait to experiment with them. And surprisingly easy to make. Best of all, I know exactly what is in them. Growing up on a farm was fantastic, but it's only as I've gotten older that I realize just how much work my parents did. I wish all kids could experience a week or two each year on a farm. I had no idea these were so easy to make! I can't buy them so this is perfect for me. Thank you, thank you! I kinda wish I didn't know how easy they were to make either. Just kidding. And in my neck of the woods, they're not easy to find, so I'm thrilled I know how to make them now as well. When I want to, that is.